A big policy shift could still halt Kabul's downward spiral. Welcome to a parallel universe. 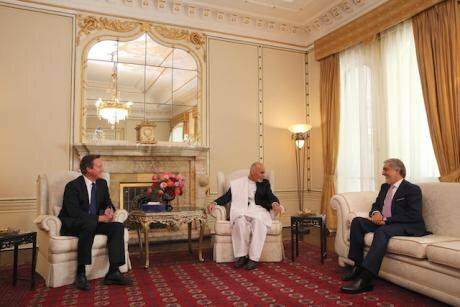 David Cameron was the first world leader to meet Afghanistan's new President Ashraf Ghani and his recently defeated opponent in the presidential race Abdullah Abdullah, October 2014. Dan Kitwood/Press Association. All rights reserved.The long war in Afghanistan was a major issue for Barack Obama's administration, and one that the new United States president inherited in January 2017. In his second term from 2009, Obama had tried to force the Taliban and other armed opposition groups (AOGs) to the negotiating table, through deploying 30,000 additional American troops. But even this "surge", which had taken the number of western troops in the country to 140,000, proved insufficient (see "Trump's Afghan test", 16 February 2017). In these circumstances, Obama decided on a policy of military withdrawal. Washington placed its new hope in training and equipping the Afghan National Army (ANA) to the point where a reasonable degree of security could be maintained. All but a handful of troops were to leave, including most of the 30,000 provided by coalition partners, with the UK foremost among this group. But even that did not work out, as spreading insecurity delayed the pullout schedule. By the end of 2016 there were still around 14,000 foreign troops in Afghanistan, as well as many thousands of private military contractors. Donald Trump’s administration is now facing a further deterioration in the security environment. A wave of attacks in the past week alone demonstrates the scale of the challenge. * On 25-26 July, in another well-planned operation, Taliban elements made coordinated assaults on an ANA outpost in Kandahar province that killed somewhere between twenty-six and up to fifty-one soldiers, according to variable estimates by the government and a senior security official. * On 20 July, the son of Taliban emir Mullah Haibatullah killed himself in a suicide-attack on ANA forces in Helmand province. This was the region of the heaviest fighting against the Taliban in 2006-10, when British and American forces lost hundreds of their soldiers. When the British withdrew, then prime minister David Cameron rashly called it “mission accomplished”. Today, much of the province is once again under Taliban influence. That the provincial capital Lashkar Gar is still in government hands is partly because of the deployment of a force of several hundred United States marines. * On 21 July, also in Helmand, an operation by US strike-aircraft went badly wrong and killed fifteen Afghan police, including two commanders. 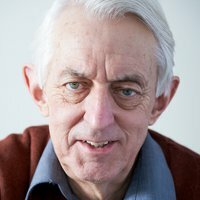 In a period when so much was already going wrong for the Afghan government, it was another bitter blow. In this perilous situation, a further concern for the American military is mounting evidence of armaments and munitions it has supplied to the ANA and other Afghan security forces reaching Taliban hands. Corruption is part of the reason, but so is the Taliban's ability to seize such material on the battlefield. The wide-ranging supplies include Humvee vehicles (some of which were later used in suicide-bomb attacks) and M-4 carbines, the lighter version of the older M-16 assault rifle. This has been in production since the mid-1990s and is now the standard weapon for much of the United States army and marine corps. Yet another concern is the Taliban’s acquisition of night-vision equipment, some of it later being used in propaganda videos. These incidents suggest that the prospects for security in Afghanistan are grim, a view reflected in several interviews from March 2017 with Nato and Afghan personnel inside the country. In one, a soldier remarks: "We face a stalemate today, but we also faced one five, eight, ten, fifteen years ago, we just didn’t know it”. The same conclusion is also drawn by Emily Knowles’s report for the Remote Control Project. In turn that process will have to involve the Taliban. It will also require the Afghan leadership itself to heal the current dispute between President Ashraf Ghani and chief executive officer Abdullah Abdullah, a point the International Crisis Group argued in its own report (Afghanistan: the future of the national unity government, 10 April 2017). But if change is going to come, Washington has a crucial role - although regional powers such as Pakistan, India and Iran are important too. This explains the air of pessimism around people who truly wish Afghanistan well. Trump shows no signs of recognising the problem. He is strongly tempted to give the US military more power to take decisions. Above all, the state department is much depleted, many of its experienced Afghan diplomats having moved to think-tanks and the private sector. This is yet one more area where Trump's White House is proving disastrous, a reality no amount of early morning tweets can disguise. Is there any other way? Perhaps it is worth speculating just for a moment. Imagine a parallel universe in which there was a country that had been involved in the war in Afghanistan since 2001, but had a government that now sought a way forward to bring the conflict to an end. Imagine that it had an experienced, professional and well-funded diplomatic service and that it maintained good relations with most of the aforementioned countries, and at least tolerable relations with the others, even allowing for recent and past history. In that parallel universe that country might be the UK, under a government that genuinely sought an internationalist direction of travel and had a strong commitment to the United Nations. Much of that description in no way applies to the current Theresa May government and a certain Boris Johnson at the Foreign & Commonwealth Office. But a Jeremy Corbyn government with an Emily Thornberry-led FCO could be very different. Yes, it is a parallel universe, for now. But it does no harm to speculate once in a while. In the right conditions, another Afghanistan is possible.